This model isn't even painted, I know. But I thought people might be interested in the fact it is white plastic. 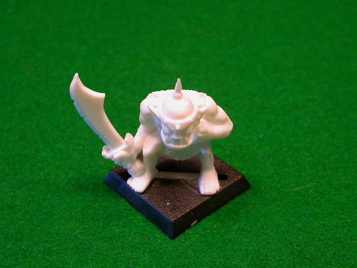 The oldest GW plastic miniature would not always grey. The original plastic Bloodbowl teams were blue and red plastic. The old Space Hulk Genestealers and Space Marines came in a variety of colored plastic. I think was a nod to the fact that people who bought these games weren't always miniature painters. By having the models in different colored plastic it made the game easier to play without painting the miniatures. This model can be seen painted but with a different head can be seen elsewhere in this gallery. You can also swap the weapons and I think they came with a variety of shields. They had slightly more variety than this era of plastic ork fantasy warriors.